Parsley is sold in bunches. Choose bright-green leaves that show no sign of wilting. Though there are more than 30 varieties of this herb, the most popular are curly-leaf parsley and Italian or flat-leaf parsley. The Italian variety, which is a deep blue-green, is more strongly flavored than the curly variety and stands up well to heat. 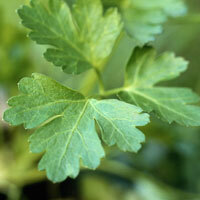 Curly-leaf parsley is milder tasting, lighter green in color, and less perishable. In addition to fresh, parsley is sold as dried flakes. However, fresh is more flavorful.